First Roadmap Workshop Completed Successfully. 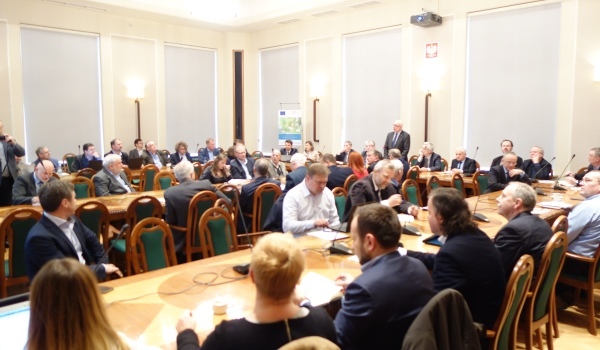 The Polish Chamber of Commerce for Electronics and Telecommunications (Kigeit) organised the first stakeholder workshop on the transnational technology and product roadmap of advanced power electronics. The workshop was hold on 29 November in Warsaw, Poland, with more than 50 participants of a wide range of companies and research institutes from energy and ICT sectors. The workshop took place in the representative chamber of the Senate at Warsaw University of Technology and was opened by Rector Jan Szmidt. Andrzei Piotrowki, the undersecretary of the state at the Ministry of Energy presented the government’s general strategy, point of view and approach for the energy sector in Poland. Afterwards, the participants discussed topics focused on policy, society and research relevant for the optimisation of the regional relevance of the roadmap. Within the Green PE project, a technology and product roadmap for the whole Baltic Sea region and on a broader level on a global scale is developed. It shall provide information such as market size and requirements. The consolidation of requirements, drives and barriers allows stakeholders to see the overall roadmap instead of being limited to their separate regions. This is especially important for the capacity building in terms of technology management at SMEs as they usually lack business intelligence tools and management routines to adequately assess technology and market trends. This workshop was only the first. Further 23 are to follow.